There are 108 games left in the Cubs’ season. They are currently 1 game out of first place. That’s a lot of time to make up 1 game. Even if this was July 1 or August 1, I still would be OK with where they are at. Even being 1 GB on September 1st would still be fine. For me, the ultimate goal is to get back to October by October. The past two days have been pretty sweet, though. With two victories against the Cardinals, the atmosphere is beginning to feel a lot like last year and 2015. The Cubs have a chance to sweep tonight and I like those chances with Kyle Hendricks on the mound. Yesterday, I read a two round mock draft from John Sickels who had a community of baseball executives select picks. The person representing the Cubs selected #27 Alex Lange – LSU Pitcher; #30 Logan Warmoth – SS North Carolina; and #67 high school pitcher Steven Jennings. I liked the pic of Lange a lot. He has a bit higher floor than other pitchers and I think with some professional coaching he could be a quick riser in the system. I would slide him in the top 10 prospects almost immediately. Like Hatch, Lange would not pitch until next year as he has already pitched a full season for LSU. No heavy hitting Chad Spanberger of Arkansas was anywhere to be seen in the two rounds. I will have more information tomorrow about six players rising and falling. There are now exactly two weeks left in the first half of the minor league season. Tennessee, Myrtle Beach, and South Bend are all in the hunt for a spot. It’s hard to believe that half the season is almost over. For Tennessee, they are the only team that holds their destiny in their own hands as the only 1st place Cubs affiliate. Seth Frankoff is starting to make a name for himself at Iowa. After two solid starts this week, his ERA has dropped all the way down to 2.79. Should there be a need for a spot starter, he would get the call. Also, Stephen Bruno and Taylor Davis are two of the hottest hitters in the Cubs’ system. While Davis did make last month’s All-Star team, I wonder how long he and Bruno will stay much past this year. Both are 26 and have not gotten a shot in Chicago. Despite losing five of six this week, they are still in first place by ½ a game over Chattanooga and Montgomery. They ran into some bad luck this week and had some bad pitching themselves. To finish the first half, they have three five-game sets against Jackson, who are a game and a half out, Chattanooga who are one-half a games out, and Birmingham, who are not in contention in the other division. The only good news this week was Trevor Clifton’s six inning start. On the other hand Zack Hedges, Preston Morrison, and Duane Underwood all gave up more than seven runs apiece. I think they’re happy to forget about last week. Thomas Hatch looks like he has finally arrived. He had two starts in the past week. In the first one he went 5 and 2/3 innings pitched and struck out 13. Last night he went 6 and 1/3 while striking out 5. He has put together three really good starts in a row. Matt Rose hit two home runs this week, and Eloy finished the week strong after and 0-9 skump. Duncan Robinson head two seven-innings starts and struck out a combined 15 batters. Luis Ayala continues to terrorize baseballs had over a .400 to clip the past two weeks. 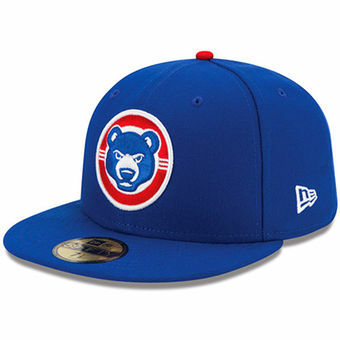 Along with new South Bend Cub Roberto Caro, the two have made a formidable bottom of the order. The problem for the Cubs is getting some consistent starting pitching from Tyson Miller, Jose Paulino, and Manny Rondon. They are four games out of first place and one behind Dayton for the wild-card position. Last year the playoff race came down to the final game of the first half before the Cubs clinched a playoff spot. It’s déjà vu all over again. Trey Martin’s rehab is going exceedingly well as he has been bashing the ball around a lot. Two names are emerging as possible breakout candidates, too. Shortstop Rafael Narea is putting himself into the SS competition with his daily hitting performance. His glove may not be as good as Aramis Ademan’s, but Narea’s hitting sure is. Rafael Mejia is another hitter who has been hitting well lately. The catcher/first baseman also has a bit of power. I am pretty sure the next week will be consumed with two things: the draft and pitching prospects. While the draft is eight days away, there is a lot of volatility as players move up and down the list, some based on performance, some based on projections, and some based on signability. I am sure there will be a profile of a prospect and maybe an update on a pitcher or two. April was a pretty rough month as temperatures kept some players down. Now that it has warmed up, so have the performances. In fact, they were many more players competing for a spot this month, whereas in April, each position was pretty clear-cut. Starting pitchers and outfielders made the most improvement over the last five weeks. In fact, the starting pitching was so impressive I went with eight starters rather than the normal six. They all posted ERAs under 3, which made the decision pretty easy. I did not put Eloy on the team as he only played in 13 games, but what a 13 game stat line. He hit .324 with 3 HRs, 10 RBI, and a .468 OBP. I cannot wait to see how he does in June. Several players will be returning very soon from the DL. They include Trey Martin, Erling Moreno, Jordan Minch, Bailey Clark, and Dylan Cease. As well, some players are starting to put it together who could make a run for next month’s squad. They include Wladimir Galindo, Luis Ayala, Robert Garcia, Dave Berg, and pitcher Thomas Hatch. Mesa, Eugene, and two DLS squads fire up their seasons this month. Most of them will be in contention for the honorable mention sections as Eugene and Mesa will only get about 12 games in, not enough to qualify. The two DSL teams start Saturday, June 3rd, and could have some names on the list. Most position players signed in the draft begin play right away. Pitchers selected take some time to get back into shape. Most of the minor league affiliates released their opening day rosters on Monday. Due to backlogs, performances, change of position, and injuries, it took a while for rosters to be finalized from this weekend. There were a few surprises when they were released, especially at Myrtle Beach and Tennessee. As of Monday evening, Iowa had not been given their roster by the Chicago. Things have changed a lot since Theo took over. In 2012, the Cubs minor league system was nearly barren. After 4 years of drafts and 5 years of international free agent signings, the Cubs system is redundant at most every position. So much so that this year’s minor league rosters have the fewest promotions of prospects. The major league team only added a few new players and that effect trickled down to the minors making fewer and fewer changes. The Cubs are getting to the point that if a prospect is to move up a level, that prospect is going to have to dominate that level to get promoted. A mediocre performance just isn’t getting it done anymore. Nothing is given, everything is earned. The Cubs should hashtag that. Here are the affiliate previews I wrote back in February for each Cubs minor league team. Most of the previews are pretty close, but today’s rosters are different in many ways. Here are ten things about the rosters I found most interesting when they were released. 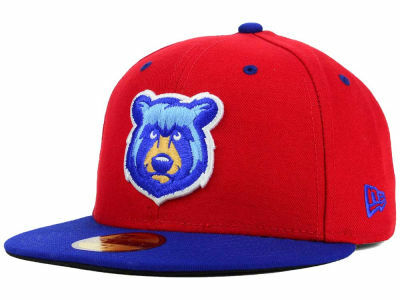 This year’s Smokies basically received only three new starting position players – Victor Caratini, Chesny Young, and Mark Zagunis. Considering that 17 of the players on Myrtle Beach won their second consecutive title, you would think more would be coming, but in reality, only these three had proficient years at the plate. Jonathan Martinez was an All-Star in the Carolina League in 2015. He did not get promoted to Tennessee. Then again, he’s only 21. But, how does a 2.56 ERA where opponents only hit .199 off you get you left behind? I am a little puzzled by that. Actually, I am a lot puzzled by that. Dave Berg and James Pugliese stay in Myrtle Beach to start the year. In 16 outings, Berg had a 1.69 ERA and was the closer down the stretch through the playoffs. Certain positions are being blocked. 3B, OF, and 2B are top heavy along with relievers. These are the positions where players were not promoted. For example, I don’t know why Danny Lockhart is on the same roster as Ian Happ when Happ is transitioning to second base in addition to being a first round pick and one of the top prospects in the system. Eddy Martinez will be in South Bend! I repeat, Eddy Martinez will be in South Bend! I was quite surprised to see this. The original plan was for him to acclimate to America in Arizona all summer. That plan has changed. And I can’t wait to see him line up beside Donnie Dewees and Eloy Jimenez every night. Preston Morrison is starting the year at South Bend. I thought for sure with his skillset and experience that he would be at Myrtle Beach to begin the year. There is no Jose Paulino or Pedro Araujo at South Bend. Both were powerful relievers last year at Eugene. I thought for sure they would be at South Bend. When Theo Epstein went out and signed several relievers this winter, most were destined to be on minor league deals at Iowa. That seems to have backed everyone up at this position. Carlos Sepulveda made the South Bend roster. I am actually pretty pumped about this! I look forward to watching what he can do night in and night out. Another player I look forward to on that team is PJ Higgins who moved back to catcher but advanced. Recently this weekend, he was timed at 1.91 on a throw to second……yes, that is very good in case you were wondering. Taylor Davis bounced all the way down to Tennessee so that Willson Contreras could be the man in Iowa. Iowa hasn’t been given their roster. On Sunday, Arizona Phil of The Cub Reporter had over 40+ names still on it. I wonder if the Cubs are working on some minor league trades instead of giving up some of these players for nothing. Several players were placed on the DL including Oscar de la Cruz and Duane Underwood. They were assigned to rehab in extended spring training (EST). Three names that seem to be rising fast at EST are pitchers Junior Marte and Jose Albertos along with infielder Isaac Paredes. Out of all the affiliates, this was the hardest team profile to do. Most of that comes from the fact the Cubs cleaned Iowa’s house after last season and that they signed about 15 arms to compete for starting pitching and bullpen spots. To be honest, I think I can name about 10-11 players who will be on this team on opening day. I can also name another 35 who could fill the other 14 or 15 spots. There are a lot of people in camp including yesterday’s signee, Shane Victorino. The AAA Iowa team in the Theo era has been a place where the Cubs stashed bench back ups, possible relief pitchers, and maybe an extra starting pitcher, too. Their roster is filled with AAAA players, organizational guys, and the occasional prospect. This year, all that changes. Why? Because the big league club is winning and Chicago needs players it can call upon in times of need. While there are a few prospects on this team who do fit into the long-range plans of the big league club, the odds of any of those prospects joining the big league team are slim. Spring training will determine who stays on the team come April 4. Out of the position players, I think that Contreras, Taylor Davis, Almora, and Villanueva have the best chance of helping the Chicago Cubs in 2016. There are going to be injuries along the way, just like there were last year with Miguel Montero and David Ross. If Ross or Montero were injured, Davis or Contreras would return to the minor-leagues when the injured player was healthy. Contreras’ 2015 season where he won the Southern League batting title stunned everyone. He had been around but had never hit above .273. Then 2015 came and he kept the bat up at a high level in the Arizona Fall League before a minor injury ended his season there. I still think there is some seasoning to do with his defensive skills and the bat should play fine in the hitter happy PCL. He may get a couple of looks in the MLB this year, but he is still one year away. On the other hand, If Almora gets to the big leagues, I don’t know how they’re going to get him back to the minors because his play probably won’t let them send him back. I think he could be ready to go to Chicago as early as this summer if the bat is hot. On the other hand, his defense would be great in late innings in the playoffs. To do that, Almora would need to be on the 40 man roster by August 31. I don’t know if the Cubs are willing to put him on the 40 man roster just yet. RP: Andury Acevedo, Carl Edwards Jr, Zac Rosscup, Spencer Patton, Armando Rivero, Brandon Gomes, Jean Machi, Scott Barnes, Blake Cooper, Yoanner Negrin, Starling Peralta, Luis Parra, Michael Jensen, Tayler Scott, Gerardo Concepcion, Matt Brazis, Jack Leathersich (Injured – TJS) and PJ Francescon (Suspended). Aside from signing Jason Heyward, John Lackey, Dexter Fowler, and Ben Zobrist, Theo and Jed’s biggest task this off-season was rebuilding the depth in starting pitching and in the relief corps. I don’t know how they’re going to pick seven or eight relievers to be the bullpen in Iowa, let alone five starters. I do think that two prospects will get a shot at some point this year to start some games in Chicago. Pierce Johnson would be first on my list. I think he’s done his time and is ready, or as close as he’s going to get to being ready. He still needs to work on his command and walks, and he also needs to pitch innings. Johnson has yet to pitch over 120 innings in his three seasons as a Cub. Ryan Williams has experience as both a starter in reliever and a body built to pitch 200 innings in a year. That versatility enhances his chances to pitch in Chicago. Williams has already commented that pitching coach Chris Bosio has already made a minor tweak to Williams’ changeup with huge results. What I like about Williams is his command. He might not be an elite arm in terms of velocity, but he does have great command. And with that command, he gets the job done. Last time I checked, getting the job done is what you really need in the major leagues. Carl Edwards, Jr. was up for the stretch run last year and that experience alone might get him back to Chicago after spring training. If Edwards can learn how not to walk people, his 95 to 96 mile an hour fastball and devastating curve might play very well this summer and Wrigley Field. As far as who makes the roster coming out to spring training, I know the seven players I mentioned above will be there along with John Andreoli, Mike O’Neill, Eric Jokisch, and Felix Pena. The other 14 spots are completely up for grabs. If I was a betting man, the only player I would bet to make the roster would be Logan Watkins, who is returning from Achilles tendon surgery. It should be an interesting when the roster is finally released to see who stays in Iowa, who might go back down to Tennessee, or who is released. 1. The big league club is on pace to win 92+ games. I didn’t see this coming at all. I thought that the team might win 85-88 games this year. I didn’t think the hitting would be as timely as it is or Jason Hammel as deadly. The bullpen is a work in progress and the 4 and 5 spots in the rotation are starting to come around with Wada now in tow. Kyle Hendricks finally looked like 2014 Kyle Hendricks with his complete game shutout earlier this week. His ERA dropped from 5.15 to 4.14 in one night. This week, about four times Addison Russell ranged to his right of the bag to snag balls clearly headed to the outfield. The problem was he never got off a throw on any of the balls he got. Each time he got to one, I kept thinking, “Why couldn’t Castro make that play on his side of the bag?” Well, if you watch on video, you clearly see where Castro is positioned far to the left of second base, not too far away from Bryant. It is an odd positioning and it makes me wonder why is he is over so far. Is it to cover Bryant? Is it because of Russell’s range? It is it because of how the Cubs are pitching hitters? 3. Addison Russell’s consistency at the plate. He really doesn’t have any yet. If you look at his last 10 games, the stats are pretty wild. He will have big nights, not so big nights, 3 strikeout nights, 2 strikeout nights, etc. I love watching him play though. What I like most about his hitting is that he is getting deep into counts. The first time through the league can be difficult for any hitter. For Russell, I think how he attacks a pitcher the second time he see them will be an interesting aspect in his development. 4. Javy Baez in knocking on the door. In 22 games at Iowa, he is batting .313 with a 393 OBP while amassing 3 home runs and 13 RBIs to go along with 6 stolen bases all while playing 11 games at shortstop and 10 at second base. His K rate is 25.5%, which is much lower. He is standing much closer to the plate and has stopped moving his bat around like a gyroscope before the ball is thrown. I do believe our little Javy is growing up. I still see him down in Iowa for at least another month. For the past two Fridays, the Cubs top prospects have shown bright. This week it was Kyle Schwarber with a 3 run bomb, Baez with one homer of his own, Duane Underwood was dealing again for Myrtle Beach, and Ryan Williams got 16 ground ball outs for South Bend to end a six game skid. Saturday night saw two promising prospect pitchers return from the DL in Corey Black and Jake Stinnett. Both had very good outings. Stinnett went three innings in his return and looked sharp with good movement. He gave up one run and struck out three. He looked much more fluid and relaxed than before his injury. Hopefully he can build on that start as his ERA was above 6 before last night’s start. Corey Black from Tennessee was flat out dealing for the Smokies in his return. He went five innings, struck out 6 and only allowed 1 hit. It was easily his best start of the year as he lowered his ERA down to 3.28. 7. Who are these guys down in Iowa? Outside of Baez and Szczur, the majority of players on the Iowa roster were organizational guys who had struggled throughout the system. Lo and behold, they made their way to Des Moines. And then this year, they put it all together. John Andreoli has put his total package of speed and tenacity and is having an outstanding year. Infielder Johnathon Mota, at 27, is doing the same. Catcher Taylor Davis should be “Ty Davis” at the rate he is hitting the ball. OF Rubi Silva and 3B Christian Villanueva are also having solid years. With yesterday’s win, the team moved one game above .500. But do any of these players have a future with the Cubs? I think Andreoli might as a fourth or fifth outfielder. Davis could be a backup catcher somewhere down the road, but that’s it. Most might not be in the organization next year because of the Rule 5 draft and only Villanueva, Baez, Alcantara, and Szczur are exempt as they are all on the 40 man roster. I don’t see anyone else making it. But for now, let’s enjoy the run they are on this summer as they do put the wood on the ball quite often. Will you be in Myrtle Beach much longer? I hear Tennessee is nice in the summer. I will have a post on this site and Cubs Insider about the draft in the next couple of days. The movement up and down is crazy. For example, Baseball America had Carson Fullmer of Vanderbilt going to the Cubs at #9 one week, the next week #1 to the D’Backs, and then this week, he was back down to #8 for the White Sox. That’s a lot of volatility. 10. Paul Blackburn might be back. He has gotten off to a rough start. His last two starts have been much improved. Although he lacks a plus out pitch, I have always liked his 12-6 curve. In his last 11 innings, he has only given up 3 ERs for a 2.45 ERA. He is not going to strike out a lot batters, but he will get them out if he uses his pitches correctly. Hitter – Kyle Schwarber – Tennessee – Last 9 games, 4 HRs and 9 RBIs. That’s pretty beastly! Runner Up – Cael Brockmeyer – hitting .375 with HR and 7 RBIs the last ten days. Runner Up – Ivan Pinyero – Tennessee – On Thursday he was just filthy. 7 innings, 6 Ks, 4 hits, no runs. I will have plenty of time to cover a lot of subjects this summer as I wrap up school on Thursday this week. I am looking forward to an exciting summer! I will be cataloging a farm museum during non-baseball hours, watching the big league club, MiLB.TV, and tweeting about it all. In addition, I need to shed about 25 pounds. So, back on the cross country bike I will go for about 12-15 miles a day. 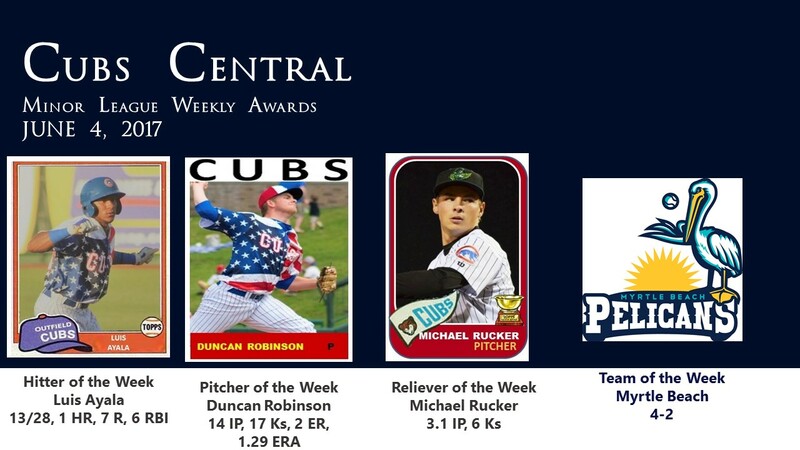 I will be writing for three web sites this summer: this site, my history blog, and my weekly posts at Cubs Insider on the South Bend Cubs and player profiles of the Cubs low A affiliate. I may also do some draft stuff for Cubs Insider, and I may make some draft cards for Cubs Den again. Those deals have not been locked in as of today – just possibilities. It looks like it will be a fun summer!!! Fifty. That’s how many different players I came up with who could possibly start the season at AAA Iowa. 50!!!!! My mind is shifting trying to figure out who the 25 are going to be for opening day. In the Theo Epstein era, AAA was not a place where the top prospects in the organization played on a daily basis in their development. It was predominantly a place to stash depth for the major league club. It was filled with players who had some experience at the MLB level. Last year changed all that. In 2014, prospects came up, went down, got called up, and returned from Chicago to work on some things. With Baez, Alcantara, Olt, Lake, Szczur, and Soler making pit stops at AAA in 2014, the purpose of Iowa changed greatly. Baez, unless he has an amazing spring training, will be back to start the year at Iowa to work on his pitch recognition and selection. The thing Epstein and Hoyer have done is to admit there is no shame in having to go back down to Iowa, or Triple A, with Rizzo being the ultimate example. If Baez has to do so, he will not be alone, and he will not be the last to go work on some things. This year, some of the top prospects in the organization will be in Des Moines, at least for a little while. Some will be hoping for a chance at the majors. Others will be on their last chance in the organization, while other players at Iowa will be stashed as depth for the major league team, or just plain guys filling out a roster – aka – AAAA players. Previous team previews this year focused on the position starters, the rotation, and the bullpen. For the Iowa Cubs, I am going to do something a little different. Since Iowa can be seen as a pit stop before hitting the big time, I am going with Green, Yellow, and Red signals for the prospects that could be at Iowa. Green means that the prospect is well on the road to Wrigley and the pit stop is just a temporary one, if even for a year. Yellow means caution as there are some concerns about the prospect or player. Red means stop. In other words, this could be the end of the line and the big leagues will escape them unless there is a drastic change. When spring training begins, the Cubs big league camp will have a lot of new faces in John Lester, Miguel Montero, Chris Denorfia, Dexter Fowler, and others. But when it comes to the 25 man roster, only second and third base will be up for grabs along with some bench positions, the fifth starting pitcher, and a spot or two in the bullpen. Some top prospects will be sent to Iowa to work on things or to play every day. A lot of the minor league signings from this winter will bide their time waiting for a bench position to open. If one does not open, they could ask for their release. But with 50 possible players fighting for those five to seven big league spots, there will be plenty of spots available in Iowa and Tennessee when it’s over. By labeling these prospects green, I think they are ready to go to Chicago. Let’s be honest, Kris Bryant is ready and the only reason he will spend three weeks in Des Moines this spring is so that he can spend an extra year in his prime in Wrigley. For the fan, it is a good call. The only weakness Bryant still has is a hole in his swing in on his waist on the inside. He knows, the coaches know, he is working on it. It will be OK.
For Armando Rivero, at 27, the Cuban reliever is ready for the show. The problem is there no spot for him yet. Someone will get injured and Rivero should be call #1. His upper 90s heat will play well in Wrigley along with the other gunners. For Addison Russell, his season should be a series of targets to accomplish. In addition to his great defense and bat, staying healthy should be a premium goal for Russell. By now, Russell is acclimated to the Cubs system and what is expected of him. I think if Chicago is in the playoff hunt this summer, Russell could see the big leagues this year. He would be just as big an acquisition as any major leaguer at a deadline deal. Out of all the hitters who could be on this roster for more than a month, he is the one I look forward to seeing what he can do in a whole year. I really think he is something special. Dallas Beeler just needs a spot. In two starts last year at Chicago, Beeler did fine. He will never be more than a #4 or a #5 type starter. I think he will be given a shot to win the 5th starter position in spring training, but his odds are slim. His strength is he does have a sinker that is built to play at Wrigley in any weather. If that pitch is not working, his low 90s fastball gets hit hard. If he comes back to Iowa, he will be at the top of the speed dial for the Cubs. Just because I labeled a prospect a yellow doesn’t mean I don’t like the prospect, I do. In fact some of the yellow prospects are my favorites. It just means that the prospect has something that is a concern and needs to work it out in Des Moines this summer. For some it is about putting in the innings or working on location or just getting the experience. Notice the pitching? Yeah, I did not at first. Pierce Johnson might be the starter closest in my opinion because of the lack of concerns. He has the right mentality, the right pitches, and the only thing he needs to work on is avoiding minor injuries to other parts of his body beside his arm. He has yet to throw over 120 innings in the minors. I don’t see him making it to Chicago this year because of the lack of innings. I don’t even foresee him making it in a bullpen role because of his profile as a starter. Set him up, let him pitch, and build that experience. Ideally 150 innings would be a great goal. Then next year, I see him coming into camp to compete for a spot on the roster. As for CJ Edwards, he has the stuff – that devastating curveball and mid 90s heat. His problem is similar to Johnson’s. He has hasn’t pitched more than 120 innings despite playing last year in the Arizona Fall League. He has better stuff than Johnson but will he profile as a reliever at the major league level or as a starter? After listening to him at the Cubs Convention, his confidence in his stuff is reassuring and noteworthy; he really wants to make it as a starter. I don’t know if he will until he does. Like Johnson, CJ needs to push that 150 inning limit in 2015. After he does that, I would move him well above Johnson. Eric Jokisch will have a chance at the number 5 starter this spring as well as a spot as a reliever. If he does not make the 25 man roster, Iowa will await. The same holds true for Zac Rosscup but only for the bullpen. For Corey Black, much has been written about how he profiles better as a reliever because of his size. However, for argument’s sake, Black has not had an injury worthy of missing large amounts of time. He had control issues last spring but wound up working over 120 innings and being the most reliable starter in Tennessee with K/9 ration of 8.68. I see the concern and I understand it, but he has no history injury. The major concern I have for him is leaving the ball up in the zone. For Brian Schlitter, Blake Parker, Blake Cooper, and Frank Batista, their chance of making the bullpen out of spring training is slim, but not unwarranted. Schlitter has shown he can do it at the MLB level if he isn’t overworked like Renteria tended to do with him. Parker had an up and down year in 2014 and I expect the same in 2015. For Cooper and Batsista, both had sub 2 ERAs as relievers at Tennessee last year and they should continue in that role this year at Iowa. They are a year away in their development. When I look at this collection, it kind of warms my heart knowing there is some depth. The bullpen, which got off to terrible starts the last two years with Marmol and Veras, is much more secure. And with the arms at Iowa, it is quickly becoming a strength within the organization. These guys are close to being Grade A but their development is not quite done. Javy Baez’s struggles are well known and documented. Unless Joe Maddon magically fixes his pitch recognition and pitch selection skills in six weeks of spring training, I expect Baez to begin the year at Iowa playing second base. As for Mike Olt, I think he might sneak onto the 25 man roster with his wider stance. With Bryant not coming up initially, Olt has a shot starting the season at third base. He can play first and third and some outfield. But let’s be real, he needs to play every day. And when Bryant comes up, Olt might be the one going down unless he is too productive at the MLB level. In rearranging his stance, he might get over the problems he had last year at Chicago. Stephen Bruno will be at Iowa for the entire year. Last year was great for him after coming off of TJS in 2013. After a .291 avg. in the first half, Bruno hit only .256 the second half. The problem will be where to play him. Naturally a second baseman, I think he can adapt quickly to playing all over the field. Like Alcantara, Bruno has the bat to play any position. He just needs the experience in the field. Last year was Ivan Pineyro’s first full year in the Cubs system. It was not a good one as he spent the year fighting off injuries. He did have a nice run in the Arizona Fall League and that gives hope to a good year in 2015. In seven games in Arizona, Pineyro started 4 and had a 1.98 ERA. He might not start the season at Iowa because of the depth of pitching. So, he could find his was to Tennessee to begin the year. Developmentally, Tennessee might be the smarter thing to do with all the arms that could be at Iowa. You really have to pull for Christian Villanueva. His glove is already MLB ready. He should begin the year at Iowa at 1B and return to 3B when Bryant goes up. Let’s hope he returns to 2013 Christian Villanueva when he led the Southern League in doubles. If he can get back on track, he could be a valuable bench player moving forward. As for Lopez and Davis, they are here in case of injury to David Ross or Miguel Montero. With Schwarber’s ascendency, their hopes of making the big leagues are between slim and none this year. Lake is seeing the window close for himself, too. He could be a bench player if needed this year and that might be all they ever will be. I would not give up on him yet. This off season found him turning into a walk machine in the Dominican. He is only 24. He, like Soler, is a physical specimen with both speed and power. However, Lake has to learn he can’t hit every pitch. The two lefties are a commodity the Cubs need. However, there is some work to do, especially for Cervenka. A 3.78 ERA does not endear him to a loogy role, but there is some hope as the Cubs do not have a lot of lefties in the system. For Bueno, he was released by the Royals despite having a drop dead changeup. If he can get his other pitchers over, he could be an asset the big league team lacks. The red means something did not go right in 2014. For most of these prospects, this could be their final year in the Cubs system. Some players like Adron Chambers might be a free agent after spring training ends if he doesn’t make the major league roster. Many of the players have not shown that they can sustain a season at AAA, AA, or in the majors. I think some of these players should float back to Tennessee like Dustin Geiger and Barret Loux where they can regain some of the form they had earlier in their career and thus can gain some confidence to move back up the organization. For many of these players, this is it for them. After five to six years, they have hit the wall in their development and there is not much left. These guys all provide temporary depth for the big league club. All have some skillset which the Cubs find valuable. Bard would be the exception as he is trying to rebuild his career. What these players do provide is some power in the bullpen. Chanbers is interesting in that he is still young and has speed. He has produced at AAA just not in the big leagues. Aside from Trey McNutt who was injured in 2014, all of these players are close to the end. This could be their last year in the system and many may be released coming out of spring training. I think the Cubs will hang on to Szczur, Silva, and Francescon one more year, but the others’ days are doomed unless they can turn it around from their poor 2014s. In the past few days, I have seen pics on Twitter of Anthony Giansanti looking ready for Spring Training. Here’s to hoping some of them stay around a little longer. Could/Should Go Back Down to AA – Elliot Soto, Dustin Geiger, Andres Santiago, and Barret Loux are four players who should start out at AA. For Geiger, who hit under the Mendoza line in 2014 after two 17 HR seasons, this would be the perfect opportunity, along with Soto, to be leaders on a young team with a lot of potential. For Santiago and Loux, they would get the ball every fifth day, something they need to do to overcome their difficult 2014. For Santiago, he needs to develop some consistency, and for Loux, he needs to stay healthy. That’s a pretty solid AAA team. Over the course of the year, Olt, Baez, and Lake have a shot at returning to Chicago along with Beeler and Jokisch. Unlike recent years, the Cubs literally have a chance to pull players for every position for use in Chicago. And what I like most is there are more players right behind them in Tennessee: Redundancy is the name of the game from here on out.